They say ‘Well begun is half done’. But, I believe that a good beginning ensures that I would never want my exciting journey to end! And, this is exactly what happened when I downloaded a free short eBook Wool written by Hugh Howey from kindle. Little did I know that I would be so impressed with the simple narration and complicated narrative that I would end up buying 532 pages long Wool Omnibus! If you have read my previous review, you would already be familiar with the closed world of Wool, where people lived in cylindrical containers called Silo, buried deep inside the earth, practiced extreme caution in partaking food, producing kids and even expressing their thoughts. All because of a very irrational fear that IT would banish them out of the protected Silo if they ever opened their mouth and expressed a wish to explore what lay beyond. Intrigued by the first part, where Sheriff Holston voluntarily agrees to go out and clean, I found myself hung in mid air till I got hold of the Paperback edition and could actually read the entire story. As I am quite impressed with the book, neatly divided into five parts, I would love to deal with each part separately, giving due credit to the author for a marvelous story where old characters are bumped off and new ones introduced throughout the narrative, creating a very exciting story. This is the first and shortest part of Wool, comprising of just 42 pages (though Kindle edition was 49), but nevertheless the most impressive. The story revolves around the lives of Sheriff Holston and his Computer expert wife Allison. Apparently, Alison had discovered something new about the Silo, almost 03 years back, which made her believe that the outside world is not as bleak as made out by the secretive IT of Silo. She yearned to go outside and was accordingly punished to do cleaning. But, before going out, she blurted out her knowledge to her husband Holston, promising to return for him. At the beginning of the story, Holston has already waited for 03 long years for his wife to return and has now decided to go out himself. Will he be able to reunite with Allison? Or is he crazy to ignore the common wisdom and would be rotten to death? The story predominantly focused on Holston’s dilemma and his final decision and by the time the first part ended, Holston and Allison became symbols of undying human aspirations. I was infected by their hopeless zeal and just could not wait to dig into the second part. Part Two began exactly where the first part ended, but in sharp contrast, concentrated largely on the inside of Silo where Mayor Jahns is left heartbroken as one of her best Sheriffs has already opted out. She wants Deputy Marnes to become the next Sheriff, but Deputy is adamant to crown a little known mechanic, Juliette as the In Charge. Popularly known as Jules, she is a unique character, born in Mids to good parentage and yet carving out a difficult labor life in the Bottoms. As the Mayor and Deputy decide to visit Jules in the Deep Down, the curtain enveloping the mysterious interior of Silo is slowly lifted. For the first time, the structure of Silo is fully revealed, where the mighty stairs are the twisted DNA of this mutant world. Not just physically, but politically also, the power in Silo is divided into three groups, the Politicos, the IT and the Blue Collared Workers. Even the society is divided into three main strata. the Up Top comprising of Rich Aristocrats, the Mids with struggling Middle Class, aspiring to reach Up Top one day and the very Down Deep Workers, who supply the Silo its very life line i.e. Electricity but are shunned by most people as unsophisticated brutes. As Part 2 proceeded, I could not help but admire the ingenuity of Hugh Howey, who has cleverly created an upside down world as a perfect reflection of our very own society. Be it political skirmishes, moral principles or daily struggle for existence, the artificial claustrophobic world of Silo eerily resonated with our free world. As the second part ended, the quest for Proper Gauge to cure the Silo of power failure is almost complete and an entire new side is revealed. Though, the writer very strategically maintained the love thread in the story. If it was the husband-wife duo in Part 1, it was the secret unlikely love between Mayor and Deputy in the second. And, I must say that the love angle made this fantasy even more real. As the Third Part began, I was slightly confused as the story began in a haphazard manner, with Jules being in the center stage of all action, in direct conflict with the IT Boss Bernard. However as the story continued, bits and pieces were placed together to create a wholesome entertainer. And, the journey that began in a shifty fashion won my heart and I just loved it. As the name itself suggests, this part unraveled the entire mystery of the Silo. Why there are so many rules, why there are rations on food and thoughts of the residents and why are the IT guys so tight lipped about the real power that drives Silo and what is the truth behind the controversial uprisings? All these questions are tackled in the fourth part and needless to say, I was hooked to the story more than ever. I read at a breakneck speed, only to be interrupted by yet another possibility of a budding romance. The fifth and the final part is the longest and most descriptive and deals with the most basic problem – the struggle to survive in a hostile environment. The way Jules tackled the strange truth and deciphered her own limits of freedom and necessity of certain restrictions, was just awesome. Had I written the story, I would have named this part Revelation, as here only Jules and even I could understand the real implications of Silo world. Though, I found the episode where Jules tries to fix the engine by submerging in water a bit too lengthy. The technical jargon and the unnecessarily prolonged climax also bored me to some extent. While the imaginative reader in me could readily accept the convoluted views and counter-views about the Silos beginning and was ready to look over n number of incongruities in the narrative, a part of me struggled to keep pace with Juliette’s digressing monologue. 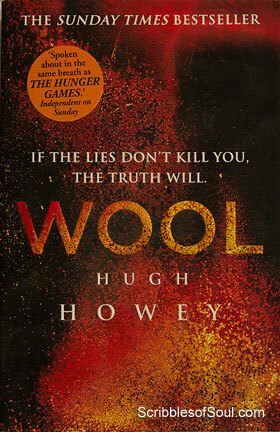 Had Hugh Howey been slightly more economical with words, perhaps, I would have loved Wool even more! But, all is well that ends well and Wool does end on an optimistic note, with the promise of many new secrets being unveiled in the next edition of Shift and Dust. I loved Hugh Howey’s straight forward approach to real life problems in the first four parts. His writing style is terse, strong and yet neutral. Most importantly, he was able to ‘show’ the story rather than just ‘tell’. Half the time, I found that Hugh was just showing me the tip of iceberg, leaving my own mind to decipher the truth. And, it was exactly this mystery that made my sojourn in the inverted world of Silo even more enjoyable. In a strange way, after reading the constricted Silo World, I can appreciate my freedom to think and liberty to speak my own thoughts even more. Last but not the least, in my previous review, I called the title Wool simple and unimaginative. But after reading the entire story, I can not help but admire the symbolic significance of Wool. If in the first part, it was a piece of cloth that the convict carried to clean the Lens and was a symbol of people’s apathy, as the story ended, it became a symbol of ignorance, with the residents pulling Wool over their eyes to absolve themselves of any injustice and cover up the bleak truth, while in reality they were the ones who were being duped! In short, Wool is a beautiful story that turned grim and entertaining by turns. Looking forward to reading Shift and Dust, and if they are even half as good as Wool, Hugh Howey deserves to be called a Classic writer in making.